What is the best theme park in Britain? The answer to that question depends on your definition of the perfect park. Do you crave the white-knuckled experience of the scariest thrill ride around? Or maybe your idea of a good time at a theme park involves something a little less hair raising, like plenty of kids attractions and educational exhibits. Whatever your theme park preferences, the good news is that Britain has parks sure to please everyone. Alton Towers is the UK's answer to Disney. The park is housed on the grounds of a 19th century Gothic mansion and has 11 different themed areas that feature rides, shows and other attractions. The park is a mecca for thrill ride aficionados. It is home to Oblivion, which was the first vertical drop roller coaster in the world, and Nemesis, the only inverted drop coaster in Europe. Despite the thrill ride focus, however, there are tons of family friendly attractions. Alton Towers is located in Straffordshire. Located in Chertsey, Surrey, Thorpe Park has more than 30 rides for adventure seekers. Unlike Alton Towers, Thorpe Park doesn't have many kid-friendly rides, but what it does have is some of Europe's biggest and fastest thrill rides. The park boasts SAW: The Ride - the only roller coaster in the world to be based upon a horror film. On Stealth, riders go from zero to 80 in less than two seconds. Blackpool is one of England's biggest tourist attractions in general, the beach resort town's theme park is one of the reasons why. You'll find Europe's tallest roller coaster, plus shows and exhibits. There are over 125 rides located in the park, ranging from tame rides for even tiniest tots to hair raising roller coasters for the adventurous. Whereas Thorpe Park is focused on thrill seekers, Legoland is a like children's wonderland. The park sits on over 150 acres of land, so you could spend a day there and still not see everything they have to offer. There are rides, mini Lego cities to explore and tons of shows. Although the focus here is on kids, don't think that teens will turn their nose up at a day at the park. 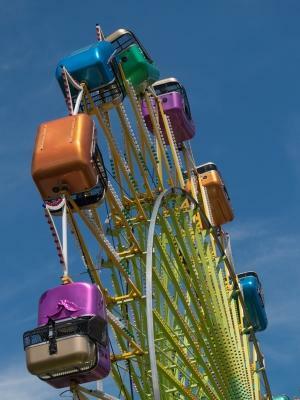 The rides run the gamut so that there is something for every member of the family. The zoo and accompanying sea life center at Chessington makes this park a good destination for family's with young children, but if you're looking for rides, this park has something in story for you, too. The park itself is divided into nine different "lands" - each land has a different theme, with some geared towards family friendly fun and other lands hosting big roller coasters and other thrill rides. Among the thrill rides, the most popular is The Vampire, a suspended roller coaster that takes riders swishing through the tree tops. Like Thorpe Park, Tamsworth's Drayton Manor is a top destination for theme park goers looking for a scare. The park is home to Apocalypse, the world's first standing vertical drop coaster, and Stormface, a water based thrill ride that is one of the park's top attractions. Drayton Manor does have an entire section of the park dedicated to younger park goers as well, including 12 kid friendly rides and a small zoo. If you are ready to explore the attractions and decide for yourself what is the best theme park in Britain, the British Tourist Authority can help you plan your trip.